Home Dog Coats A few reasons to put a coat on your dog – Important for winter weather! Dogs wearing clothing may be cute, but sometimes there are great reasons to put a dog jacket or coat on your pooch. Many experts point to how long dogs have gotten by without wearing coats as a good reason they never truly need one. But here are a few reasons why you might want to go with your instincts to keep your dog warm. Dogs have a layer of skin and fur that keep them warmer than our skin keeps us. Because of that, they might not need the same type of protection from the cold that we do. But even if you believe dogs don’t need coats to stay warm, consider the comfort for your dog and the convenience for you of not having to remove tiny ice balls from your dog’s fur. If you intend to play in the snow with your pup, an EzyDog dog jacket or coat can help much of your dog’s fur from become icy or snow-packed. No matter how comfortable your dog might stay in the cold, being coated in snow and ice has to be less than comfortable. And it can take a lot of time for you de-ice your dog after a romp through the snow. A coat helps prevent this problem. A dog that’s running through the park and playing is going to stay warmer than one sitting still, just as you’ll be warmer walking or running than standing in one place. If you plan to take a walk or head outside on a trip where you might be stopping and holding still a lot, your dog might feel colder than on a trip where you’re moving constantly or briskly. 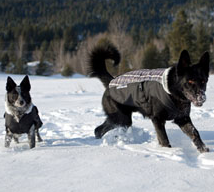 Using an EzyDog winter dog coat can help eliminate the chill of standing still, especially if it’s a windy or wet day. Vets do tend to stress a dog’s natural temperature regulation when talking about pet clothing. Their systems aren’t the same as ours, and it’s important to keep that in mind. It’s important to use the least-warm dog coat that seems reasonable to avoid your dog overheating. You wouldn’t want to put a thick, heavy coat on a dog on anything but the coldest day, for instance, since it could be easy for your dog to get too hot. Dog jackets are best for days where extreme temperatures probably aren’t going to be a problem. And on warm days, it’s best to forgo any kind of coat at all. If you want something fashionable, opt for a fancy dog collar instead.